Audi has revealed the Q8 sport concept at the 2017 Geneva Motor Show. 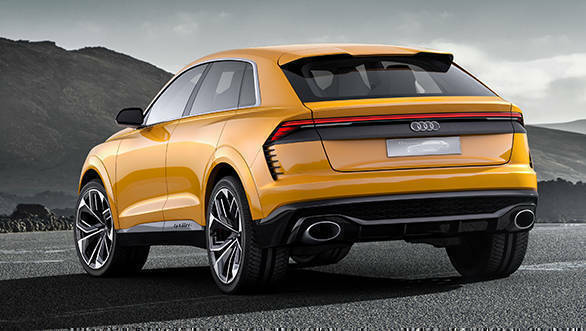 The Q8 sport is the second concept that Audi has revealed in the Q8 range, and it is powered by a newly developed petrol-electric hybrid drivetrain. With the Q8 sport concept, Audi has pioneered the use of the Electrically Powered Compressor (EPC) for the first time in a petrol engine. We had earlier explained the working of the EPC technology when it first debuted in the diesel Audi SQ7. In the Audi Q8 sport concept, the electric motor's additional 27PS and 170Nm output help crank up the total output of the 3.0-litre turbo-petrol V6 engine to 476PS and 700Nm during boost operation. According to Audi, the EPC supports the turbochargers at times when there isn't enough exhaust gas to spool them up. This also allows the transmission to hold onto a higher gear for longer even when the turbochargers haven't spooled. The 0.9kWh Lithium-ion battery pack located at the rear of the SUV under the luggage compartment coupled with a 48-Volt electrical system ensures that there is sufficient power for the EPC to function. The brand says that the Q8 sport concept's 6-cylinder hybrid drivetrain will offer the performance of an 8-cylinder engine and the efficiency of a 4-cylinder engine. This, combined with an 85-litre fuel tank, is expected to give the SUV a range of almost 1,200km. 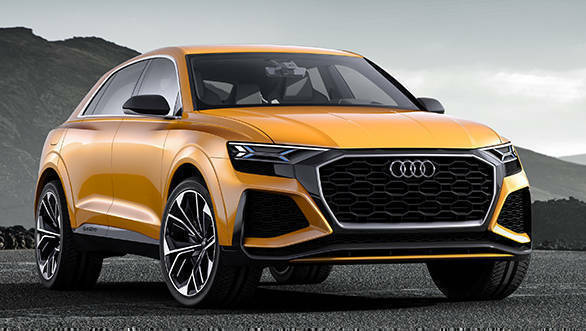 Audi has also implemented a few changes in the design to make the Q8 sport concept look sportier than the standard Q8 concept with a new grille and bumpers. The sport concept rides on 23-inch alloy wheels with an intertwining spokes design shod with 305/35 section tyres. With 0-100kmph acceleration touted to take just 4.7s and a claimed top speed of nearly 275kmph, the brakes too had to be massive. Sporting 508mm carbon-ceramic discs, they are. The production-ready versions of the Audi Q8 concept and sport concept are expected to be revealed in 2018. With the Q8's cousins  the Porsche Cayenne and the Bentley Bentayga  already in the Indian market, it's likely to make its way here too.